As I write this, it is actually snowing here, not a common occurrence in Salem. I tried to obtain photographic evidence, but it eluded me. Even though it’s highly unlikely that any of it will stick on the ground, the mere sight of snowflakes drifting down is the perfect occasion to bake another batch of streusel-topped muffins, don’t you agree? Then again, what isn’t a good time for streusel? I had some extremely ripe bananas just screaming to be made into banana bread, and had schemed to sneak a chocolate-marbled loaf under Jeremy’s radar. But in the end, I decided that I didn’t want to wait over an hour for it to come out of the oven, so banana muffins it is. Starting from a heavily-reviewed recipe on AllRecipes, I tweaked it a bit to our tastes. 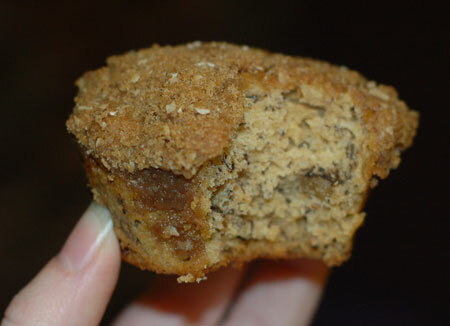 These have just enough nuts and spices to enhance the banana flavor, and the moist texture of the muffin is nicely counterpointed by those crunchy streusel caps. The perfect accompaniment for morning snow showers… which already seem to have ended. Darn it! Preheat oven to 375F. Lightly grease or paper 12 muffin cups, or use a silicone muffin pan. In a large bowl, mix together flour, baking soda, baking powder, salt, cinnamon, allspice and walnuts. In another bowl, beat together bananas, sugar, egg, melted butter and vanilla. Stir the banana mixture into the flour mixture just until moistened. Spoon batter into prepared muffin cups. In a small bowl, mix together brown sugar, flour, cinnamon and oat bran. Cut in butter until mixture resembles coarse cornmeal. Sprinkle topping over muffins. I’ve used this same recipe from allrecipes! !